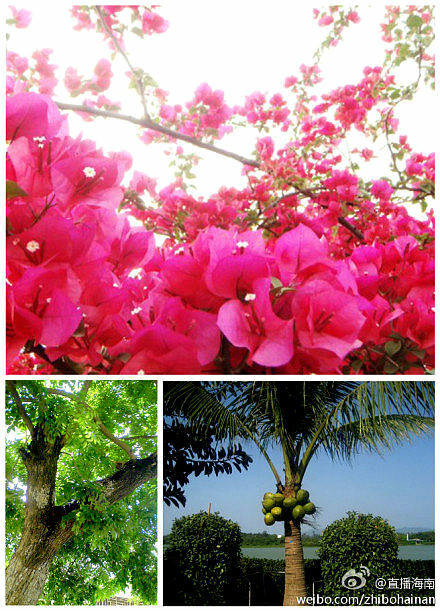 The coconut & Huanghuli trees, together with the bougainvillea flower have been officially confirmed as provincial trees and flower of Hainan. At present, most of the other cities and provinces in China have confirmed their city and provincial trees, for example Beijing has scholartree and arborvitae trees as its city trees, and roses and chrysanthemums as its city flowers. Hainan, as the only tropical island province in China and an original habitat of tropical plants, is the only province to make Coconut and Huanghuli trees and the Bougainvillea flower as the province’s trees and flower, but bougainvillea flowers have been chosen as the city flower of Sanya, Xiamen, Zhuhai and Shenzhen.